Makeup Mistakes Spoil Your Personality. Makeup… This term is so closed to a women and nothing can ever replace it, whatever the circumstances transpire. Every female desire to collect a lot of makeup products and then used it as a weapon to look stunning. For this buying of makeup stuff is first and foremost item in shopping. Buying favorite lipstick and eye shade color give emotional relaxation to females. While doing make up there are some mistakes which we do and this obliterate whole look and make you uglier. Yeah those products which we used for looking gorgeous sometimes there erroneous use reflect the darkest side. 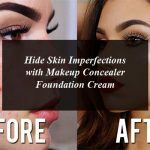 Always buy that foundation shade which do match with your skin tone and gives you magnificent glow, be judgmental during foundation selection and have best brand foundation for your skin. According to Ellis Faas (makeup artist): “Just choose two shades that come closest to your skin tone, apply each of them to your jaw line go outside to natural light and look in a mirror.” Use your own decision to see which one looks most natural. Select the natural one for your skin tone. A perfect base will give perfect makeup. Try to switch your foundation with reference to season, don’t use same foundation in whole year as in summer & winter skin mode vary a lot. Using sun screen is a must thing, it gives you protection from sun rays and climate conditions and your makeup will stay longer. So use 25 SPF or higher than it. Don’t apply too much face powder for looking fair as it will appear your face as heavy & cakey and Apply powder only where needed. Some females wants to give a darker shade to their eye brows so they apply black pencil & black shade there is heavy amount, this kind of act makes you look ruthless so make them look natural and shape them lightly with light brown pencil and brow powder. Blush on color should be light to carry as applying a lot of dark blush on color will spoil your look. Do smile and apply it with cheeks line in center from upper to lower side. Putting blush on a lower part of your cheek can drag your face down and look overdone. Don’t make yourself joker, stay classy and give natural impression to your makeup. Applying mascara add spark to your eyes so don’t apply mascara after curling your eye lashes. Apply mascara in shape of your lashes; try to give it upward movement, use water proof mascara. Lipstick is most favorite item for every female apply lipstick with lipstick brush will give natural look. If you have thin lips and want to make shape, do apply foundation on your lips then with help of brush make boundary just above your lip line and do fill it with lipstick. Don’t apply dark lip liner, have your lip liner match with your lipstick shade. If you are applying red lipstick, use light eye shade and blush on. Apply white shade before applying require color after this use black shade in the end for giving edge to your shade. Using dark colors combination will give rough appear so do have combination of dark color with light one. Concealer works wonders on dark circles, after applying concealer, try setting your concealer with a very light coat of lucent powder.